'Little House' cottage; well-being and relaxation located in South Opal Coast. House with a nice mature garden and nice view. living room, dining room, kitchen (with dishwasher), shower room (with washing machine) and bedroom. Total surface of 70 sqm. This property offers a terrace with a barbecue, a 300 sqm garden, a playground, a spacious courtyard to park car(s). This house was designed to combine comfort and conveniency, its decoration is quite contemporary. You will enjoy an unobstructed view towards the countryside (fields, groves) and towards the village. You will find quietness. 10 min away from the beaches: the nearest are Berck, Merlimont, Fort-Mahon to the south. - 7 minutes away from Montreuil, charming medieval and tourist city. Apart from a time travel, this historic town offers you also quality restaurants, different shops and supermarket. In August, you can see a very nice son et lumières of 'Les Misérables'. The hiking lovers or just walkers well be happy with nice paths to discover from the fortifications. Bathroom of 10 m² with hand basin, a shower and a washing machine. There are 1500 free international channels. Television with digital channels, DVD player, and cot. Thank you very much and may be see you an other time ! We were given a warm and friendly welcome by the owners, a lovely hard working couple who were nearby but never intrusive. The Little House is in a peaceful village and the garden really is family friendly with plenty of space and high hedges surrounding a huge lawn and patio. We were happy to spend our summer holiday here with our 2 dogs, it's a very comfortable little house and found plenty to go out and see.There's ample parking on the drive and it's a few minutes walk to the main street for the early morning bakery- fresh baguette for breakfast- and the little supermarket which has a good range of fresh milk, juice, veg and meat etc. We found plenty of restaurants/bars in every town we visited where we could dine with the dogs sitting under the table. A very enjoyable experience. We thank you for the assessment very much. It was nice to welcome you. May be for another time ! this is a very nice house in a rural environment. The house is pretty clean and very well equipped with everything you need in kitchen and bathroom. A large garden invites children and dogs to play in safe surroundings. We felt very well during the time we passed in the „little house“ and say „thank you“ to the friendly owners! We hope to meet you next time. This little cottage was a perfect base for exploring this underrated part of France whilst we were there we spent some time in Berck watching the seals, Amiens and its beautiful medieval houses and Victor Hugo's house and of course Montreuil which is just 10 minutes down the road after which we would come home and relax inside or outside with a bottle of wine and dinner. The owners were fantastic very helpful, on the occasion of our gas bottle running out M. Routier was there in 5 mins, they were on hand but only when needed. All facilities were as described and the shower especially is good. Perfect place for a couple I think. We hope, it'll be usefull for people who look for the same cottage. Since 10 years we started, we try to get it better. Glad to see you twice! We would highly recommend this cottage to all couples & families, & dog owners too (internal stair-case is not for anyone with walking difficulties though). 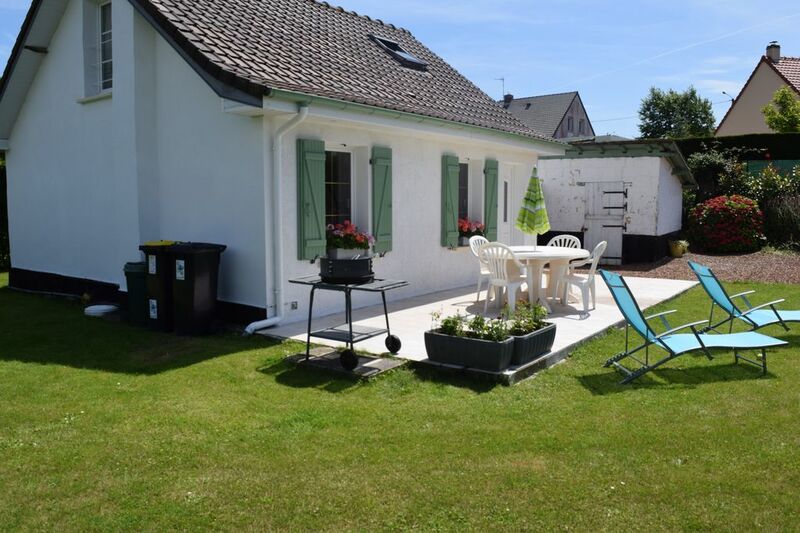 Set in peaceful surroundings, just an hours easy drive on the motorway from the Euro tunnel. The illustrated pictures accurately reflect a modern & clean holiday home. Excellent amenities & good range of household/electrical goods available (-we took DVDs/CDs). Provisions easily purchased at any one of the many supermarkets just 15 mins drive away (butchers/bakery & florists are the only local shops within walking distance, which helps add to the peacefulness of this well-kept hamlet). Madam warmly welcomed us with a good command of the English language, making herself available if we needed help, which was re-assuring. Whilst there, we enjoyed picturesque walks from the old church nearby and also visited two lovely beach towns - Le Touquet & Berck - both just 1/2 an hours drive away. We would defiantly return again, it was very good value; in peaceful safe surroundings and very welcoming. ......."A l'année prochaine". We thank you very much for you comment! It's very kindly from you and we will welcome to you when you want. Wir haben uns sehr wohl gefühlt. Das Haus ist gemütlich eingerichtet und sehr sauber. Das Ehepaar Routier war sehr freundlich. Unser Highlight war die Tischtennisplatte im Garten. Deutsches Fernsehen ist vorhanden. In der näheren Umgebung befinden sich mehrere Möglichkeiten einzukaufen. Der Strand ist mit dem Auto gut zu erreichen.Wetter war hervorragend. Unser Hund hat den großen Garten geliebt. Alles in allem, hatte wir einen tollen Urlaub. Wir bedanken uns bei Ihnen für Ihre Einschätzung und wären glücklich, Sie noch einmal zu empfangen. Famous village, Wailly-Beaycamp is a town of Opal Coast. It is located 5 km south of Montreuil-sur-Mer. For ten years, the town grew in order to meet inhabitant's needs as well as summer holidaymakers. You will find hiking and forest paths. In a quiet street, the house has a perfect location where you will be able to enjoy quietness. You can easily access to the highway (many directions: fast access to the entire coast, Somme department...) . The very nice walled town of Montreuil-sur-Mer is 5 minutes by car. You also can enjoy a very nice theme park in the town of Rang-du-Fliers, at only 10 minutes by car from the cottage. 25% d'acompte pour réserver; 150 euro de caution et le solde restant (75%) à l'arrivée. La caution n'est pas encaissée par le propriétaire et est remboursée en intégralité si tout est en ordre. Le prix pour une semaine est de 450 euros en moyenne saison. Le prix est de 535 euros pour la haute saison. Les animaux sont acceptés.le prix est de 20euros par chiens.pas plus de 2 chiens Nous ne fournissons plus les draps ni les serviettes. Internet et la télévision sont gratuits et accessibles.